As a working mom, it can feel impossible to balance keeping a clean organized home with making time for your family (and trying to slip in “me-time” somewhere in there). Sometimes it can feel like you leave one job just to clock into another. If you’ve ever asked yourself “How can I keep a clean house while working full time?” this printable cleaning schedule for working moms is for you, my friend. Because you don’t have time to spend hours a day cleaning to keep your home clean and orderly. You want to spend your evenings relaxing and enjoying your kids in a tidy home. As a working mom, you need a simple and quick cleaning schedule. And this home cleaning schedule will keep your home clean with just a few daily habits. Your cleaning can be broken down into 3 times: morning, evening, and then whenever you fit in a 30-45 minute cleaning session in which you’ll do 15 minutes of laundry (or less) and your daily chore. I know it seems simple. But it’s seriously miraculous. As a working mom of 4, it doesn’t take much for my house to look like an episode of hoarders. 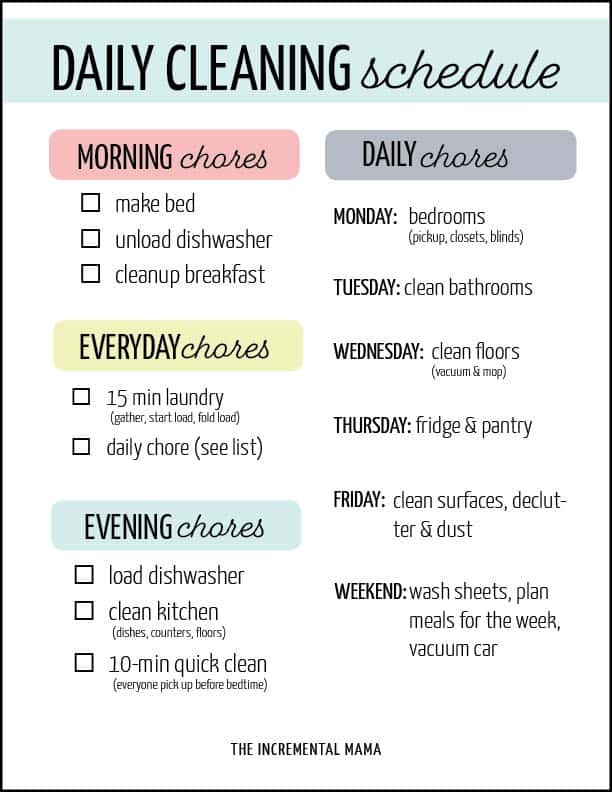 But when I follow this simple daily cleaning schedule, I spend less time cleaning yet somehow my house stays organized and tidy (despite small children hell-bent on destruction). The magic is that by doing a little every single day, things don’t get out of control. If you spend about 15 minutes on laundry every day, you will always be up on laundry, have plenty of clean clothes in your drawers, and never have your children complaining about not having clean socks. In a nutshell, all you do is spend a few minutes gather up laundry around the house (I just do it as my normal routine as I make my way around my home), throw in a load of laundry, and fold the load from yesterday. I do this with my family of 6 and some days I don’t even spend 15 minutes. First, you’ll want to figure out when you’re going to do your daily cleaning tasks. When will you fit in the morning and evening chores into your days? Will you unload the dishwasher while you make breakfast or after a quick morning run? And what about the 30 minutes for laundry and your daily chore? The best way to build these new habits into your schedule is decide exactly when you’ll fit these things into your day. You want to be as specific as possible to create new habit/routine. And once you decide what works best for you (which can take some trial and error), you’ll want to block out that time every single day. If you’re a morning person, clean house first things and knock it out before your kids are up. If you’re not (like me), do it right when you get home or after the kids go down to bed. Scheduling it at the same time everyday increases the chance you’ll do it. It’ll become a habit. You won’t debate with yourself whether to clean today or whether to veg on the couch and watch some Netflix. You’ll just get up and go. And before you know it, everything is all neat and tidy. I know that when you have limited time at home with your kids, 30-45 minutes may seem like a lot to block out every day. But let’s be honest, you probably spend at least that much time scrolling your phone in your downtime. Putting it towards keeping your home organized and orderly despite working full time is going to result in you being more relaxed at home and having more quality time with your children and family. When it comes to starting something new, I’ve found that starting slowly as opposed to blasting like a rocket ship into a completely new routine tends to mean that the habits and changes are more likely to stick. So if this cleaning schedule feels overwhelming, then start a bit smaller. Just work on the morning and evening chores. Then add in the daily 15 minutes of laundry. And once you’ve got those down, add in the daily chore. And you’ll be amazed at how easy it is to keep a clean home with these simple habits. Subscribe and download your free cleaning schedule and get started with a simple daily cleaning routine. The trick to keeping a clean house isn’t to spend hours everyday cleaning, it’s just do it EVERY DAY. Just a little focused cleaning every single day will mean your house stays clean without much work. Have you ever spend an entire day cleaning? On a day off, you spend sun up to sun down hard at work attacking clutter and grime because so-help-me-this-house-is-going-to-be-clean. And then after hours of scrubbing, wiping, vacuuming, and decluttering the house looks amazing. Your kids are in tucked into bed, the house looks pristine, and so you stumble off to crawl under the covers with intense satisfaction. But then it feels like you blink and suddenly your house looks like news footage of a tornado’s aftermath. Been there. More than I’d like to admit. Which is why I’ve found that it’s infinitely better to bite a little off every single day than have some massive weekend effort that leaves me catatonic on the couch. I know the math doesn’t make sense, but your house will stay cleaner with 30 minutes a day of cleaning than with a massive 10-hour slog on the weekend. I used to be a crazy Saturday cleaner. I’d spend the whole day scrubbing, vacuuming, doing a thousand loads of laundry, folding mountains of clothes and then limp off to bed. Only to have my house destroyed a few days later. Now, I follow this method, my house stays clean and I don’t spend near as much time cleaning. Here’s why: when it comes to keeping a clean house, it’s like you’re on an escalator. So even when you’re standing still, you’re not really standing still. You’re headed down. Down into the piles of laundry, a sink full of dishes, and endless clutter. So when you say “Oh my gosh, I’m exhausted. I’ll clean tomorrow” the problem is that like some parasitic alien in a scary movie, the mess will grow much bigger by tomorrow. It’s way scarier, and harder to conquer. By biting off a little every single day, you’re not going to spend much time cleaning, but your house will always be pretty dang clean. One of the best ways to keep tidy house is to build cleaning into your every day schedule. So you’ve worked all day and you finally get some time with your kids. The thought of ditching them while you clean sounds mighty unappealing when you get want to snuggle and talk about their day. Which is why having them clean with you is like killing all the birds with one stone. One, you’re keeping your house clean which means you’ll be a happier and more relaxed mama. Two, you can spend quality time with your kids talking about their day while folding clothes or scrubbing the toilet. And three, you’ll be getting your kids in the habit of cleaning every day. Teaching your kids to clean now is like writing checks you get to cash over and over in the years to come. And there’s really no such thing as too young to clean. Research suggests that the best time to teach kids to clean is when they’re toddlers. Because they naturally want to be helpful, when you get them in the habit of helping around the house, they keep doing it as they get older. And if your kids are older than toddlers, it’s never too late (unless they’re unemployed, 35, and living in your basement playing video games). The Simple Phrase to Stop Whining and Get Kids Excited to Help. To reduce general clutter (and therefore the time spent cleaning), following the 1-minute rule will go a long way. Here’s what it is: basically anything that can get done in less than a minute, you do right away. You put away the stuff on the counter, file the bill, return the text message, wipe the light switch that looks like it’s been sneezed on. If it’s a quick task, you do it automatically. This keeps things from building up and feeling overwhelming. This rule alone keeps clutter at a minimum at our house. When it comes to cleaning and tidying up your house, a little everyday goes a long way. As a working mom, you don’t have time to spend hours everyday cleaning. Which is why you need this easy printable cleaning schedule that will keep you sane, your house clean, and give you relaxed time to enjoy your family. Download the free daily/weekly cleaning schedule, put it on your fridge (or where you can see it) and start to see the benefits of a little cleaning every day.